Outdoor Activity #2 – Skiing! Grab your sticks, there’s still snow in those mountains and some great spring skiing conditions! I’m going to run through the basics of skiing and some of my favorite places to ski in the area. It is a great winter sport and definitely something to try if you live in the area and have yet to make it out. The first thing you need is to make sure you have the proper gear. Skis, boots, pass, goggles, gloves, poles are the basics, but I’d also recommend a helmet, sun screen, warm waterproof clothing that is comfortable, and of course a proper vehicle to get you up to the mountain. The skis should be the proper length, here is a great guide for determining the length of the skis you should be using. If you would like lessons, every resort offers them for different skill levels and I’d recommend calling in advance and reserving a lesson so you don’t miss out when you get up there. If you are feeling confident, that’s awesome, go for it! Don’t be afraid of the mountain and don’t let other people’s skill levels discourage you, everyone is out there to have fun! This is the largest resort in the Tahoe basin. 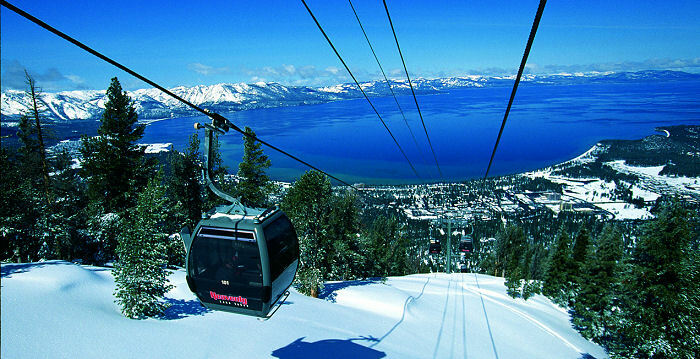 It spans over California and Nevada and offers some of the best views of the lake. It has terrain for every skill level from long, flat runs on Boulder to steep and deep vertical in Mott Canyon. I grew up riding this mountain and would definitely recommend it as it is one of my favorites. It can be crowded on the weekends but midweek is an excellent destination. If you love tree skiing this is a great place for it! Kirkwood and Squaw Valley are excellent ski resorts. They are similar in that they offer very challenging terrain. Kirkwood is known for receiving more snow than most ski resorts and on a powder day it will be the place powder hounds flock. Squaw is an awesome hill and offers more open, steep terrain than most ski resorts. If you are an intermediate to expert ski level looking for a challenge I would point you to either of these mountains. These two mountains are more family-oriented, small scale operations. They have excellent programs for children learning to ski and are great places for the family to spend ski days together. Mt. Rose does offer steep, challenging terrain in The Chutes and also generally has cheaper day ticket prices (ranging from $40 to 80 a day). These resorts are both medium sized resorts on opposite sides of the lake. Alpine Meadows is in the north, and is the sister resort of Squaw Valley. It offers steep terrains and generally is not as crowded as Squaw. I enjoy going to Alpine on days when I know that Squaw is going to be a zoo. It is also has terrain from beginner to expert and has terrain you can hike to if want to go for a backcountry type of ride. Sierra-at-Tahoe is tucked away in the trees south of Tahoe. It has some of the best tree skiing and also is a popular destination on a good powder day as it also gets more snow the most resorts. On a sunny, bluebird day I would choose Sierra if I was staying in the South Lake area. Here is a map of ski resorts in the area. I really encourage you to get on the hill if you have yet to this season! Skiing is such a blast and a great way to spend a winter day. For me, skiing is a way to get outside, challenge myself, have fun with friends, and see some spectacular views from the tops of mountains. Go try it, come back here, and let me know how it went! Or if you already ski, tell me why you love it and where you ride! This entry was posted in Uncategorized and tagged Alpine Meadows, Heavenly, Kirkwood, Mt. Rose, Outside, resort, Sierra-at-Tahoe, Skiing, Squaw on March 24, 2013 by joshvega.